Yesterday, barely two weeks since the November 13 terror attacks killed 130 and led to the closure of large sections of Paris around République Square, violence again erupted in the streets of the city. With 120,000 soldiers and police forces deployed across France, and fully 6,300 police and paramilitary riot police mobilized in downtown Paris alone, République Square was again blocked off by a massive police cordon. The target of this deployment, held under the state of emergency imposed after the November 13 attacks by the Socialist Party (PS) government of President François Hollande, was not, however, a group of fighters loyal to the Islamic State in Iraq and Syria (ISIS). Rather, it was a domestic social protest mounted by ecological groups against the COP-21 ecological summit opening today in Paris. The state of emergency bans all forms of public protest for three months, and police seized upon this standing ban to stage a brutal crackdown on a crowd of several thousand people. République Square, which had seen vigils for the victims of the November 13 attacks and official appeals for national unity, was filled with tear gas as police shot rubber bullets at peaceful protesters. Citing acts of violence by a group of 80 masked protesters, police then proceeded to arrest 289 protesters, detaining 174. Even before the protests, police had used their emergency powers to place two dozen ecological activists under house arrest without trial. This was part of a broader crackdown across France since November 13 that has seen over 100 unidentified people put under house arrest. The crackdown on protests goes hand in hand with the broader terrorizing of the public by the state. Anyone who goes into the streets is soon confronted with men wearing body armor and carrying assault rifles. Business groups have already called for employers to use the state of emergency to monitor the workplaces and denounce “radicalized” workers to police. 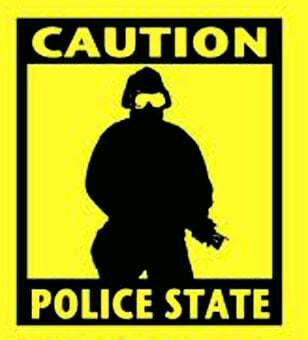 The World Socialist Web Site has repeatedly warned that the police-state measures implemented internationally under the rubric of the “war on terror” since 2001 were the expression of a fundamental breakdown of democracy. Anyone who thought that these were empty words should examine what has happened in France since the November 13 terrorist attacks. One must call things by their right names: what is being established in France is a police state dictatorship. Due to the activities of a handful of people who carried out the November 13 attacks, social protest has effectively been banned; police have received arbitrary powers to carry out searches and seizures and the state has given itself enormous powers to detain individuals and dissolve organizations. The PS aims to make this state of affairs permanent, moreover, by passage of a constitutional amendment. The multi-party organization of the bourgeois political establishment and the maintenance, at least for the present, of the formal routines of elections are no obstacle to the conversion of France into a police state. As the virtually unanimous votes in favor of the state of emergency and of stepped-up bombing of Syria in the French National Assembly show, these policies enjoy the support of all the institutions of the state and all the political parties, including nominally “left” organizations. Nor has any criticism of the accelerating drift towards authoritarian rule in France emerged from the ruling establishments internationally. Rather, as Washington directs the spying of the National Security Agency at the American people, and Berlin and Tokyo dust off their plans to re-militarize their foreign policy in the face of public opposition, all the major imperialist powers are watching events in France and preparing their own versions of these measures. This political crisis is uncovering the absence of any constituency for bourgeois democracy in the capitalist class. The driving force behind the PS’ assault on democratic rights is not the terrorist attacks of Islamist opposition forces in Syria, who in any case serve the imperialist powers’ agenda of regime change against Syrian President Bashar al-Assad. Rather, it is the extreme social polarization between a super-rich financial aristocracy and broad masses of increasingly exploited and impoverished working people. Austerity policies pursued over seven years of the most devastating global capitalist crisis since the 1930s have thrown tens of millions of people into unemployment and shredded basic social programs across Europe. Only a month before the Paris attacks, the French bourgeoisie was stunned and horrified when Air France workers confronted executives and union bureaucrats planning mass layoffs and tore the shirts of two Air France executives—an act that received broad support among workers across France and Europe. “By analogy with electrical engineering, democracy might be defined as a system of safety switches and circuit breakers for protection against currents overloaded by the national or social struggle. No period of human history has been—even remotely—so overcharged with antagonisms as ours. The overloading of lines occurs more and more frequently at different points in the European power grid. Under the impact of class and international contradictions that are too highly charged, the safety switches of democracy either burn out or explode. That is essentially what the short circuiting of dictatorship represents,” Trotsky wrote. Today, as during the great struggles of the 20th century, class tensions are building up that are overloading the circuit breakers of bourgeois democracy. A powerful constituency remains for democracy and democratic rights: the working class. The fact that accumulating class tensions lead to such drastic attacks on democratic rights is, however, a stark indication of the revolutionary character of the situation and the urgent necessity of an anti-capitalist struggle based on a revolutionary, socialist perspective.